GARLIC! This week will include our annual garlic harvest. We look forward to a long, hot, dusty day when we get to see the results of ten (!) months of waiting. We’ll keep our fingers crossed and hope that each clove we planted last October became a beautiful bulb. Each bulb will get pulled from the ground, dusted off, and lifted to the upstairs of our small barn in the tractor bucket. There, it will get laid out to dry and cure with thousands of other bulbs on our fourteen drying racks. But while some garlic is curing, if all goes well you can look forward to incredible fresh garlic in next week’s share! For those of you who pick up at the UU church on Sundays, Cheryl Denz from Terra Optima farm plans to have pork and beef for sale when she makes her chicken and egg csa deliveries. This is open to everyone, so stop and talk to her about what will be available! Finally, I’ve decided to go lower-tech on the blueberry orders. The online sign-up program proved to be a little too complicated for me to figure out at this time of year. So, please simply send me an email if you would like a box of blueberries. Pick up can be at the farm on Thurs August 4th or Monday August 8th, or in Rockland on Sunday August 7th. We are not able to do home or workplace delivery for the berries, but you are welcome to sign up for pick up at the farm on any day. You can mail the check for $35 to us at the farm, or bring it to the pick-up. We have so enjoyed the many notes and emails we’ve received about the shares. Keep the comments coming! Blueberry Details: Certified Organic Wild Blueberries from Red House Farm in Waldoboro. 10 lb box for $35. Pick-up at UU Rockland on Sunday, August 7th (10:30-11:30am), or at the farm on Thursday August 4th or Monday August 8th (5-7pm). Email info@hatchetcovefarm.com to reserve a box and a pick-up location. Contrasting scenes of life on the farm at 98 degrees. 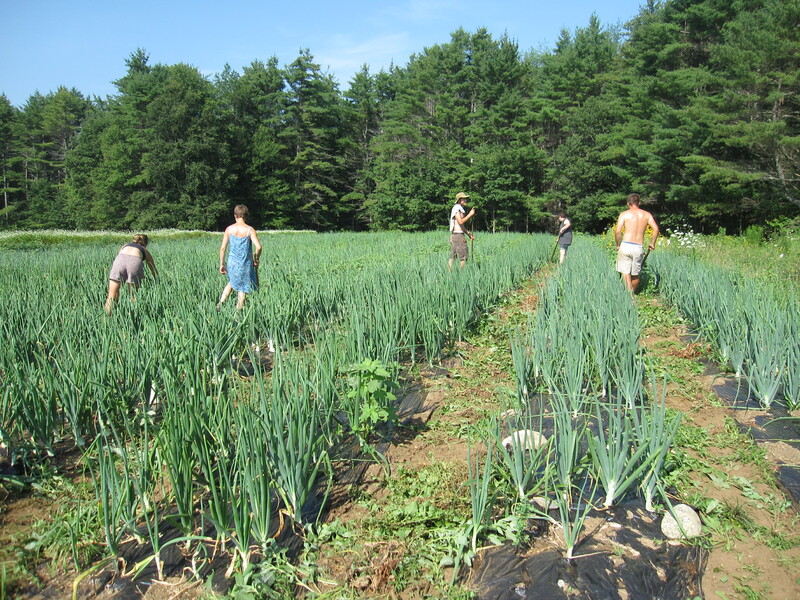 Top picture: the apprentices weeding CSA onions (they got the rest of the day off, I promise). 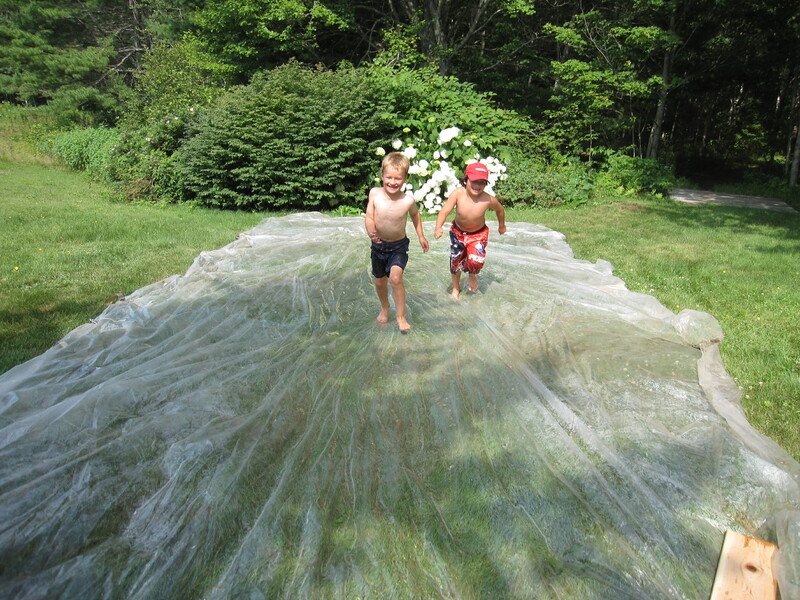 Bottom picture: Eli and his friend Miguel, running up their slip-and-slide made of greenhouse plastic. Looking at these pictures, we’re not sure why Eli thinks life on the farm is so onerous!